Unique Astrology gift book gives humorous insight into Scorpio personality. Click Here! Astrologically speaking, the Sun stands for your inner nature and stamps your innermost character. Slinky Scorpio is your sign, so the Sun blazed in a passionate water sign on your birthday. Scorpio, the eighth sign of the Zodiac, is feminine, ruled by fierce Mars, the warrior planet and dark Pluto, the planet of transformation. A fixed (strong and solid) sign, Scorpio governs will and authority. 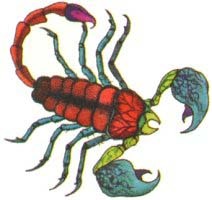 Scorpio people are passionate and emotional, with very deep feelings. Although you are a loyal and dedicated friend, you are fiercely competitive, subject to fits of vindictive jealousy – and can be quite manipulative in pursuit of your goals. Click this to test your compatibility with all signs, or check out these signs, the most compatible for relationships with Scorpio! Symbols for Scorpio are the scorpion, a ground-dwelling killer with a poisonous sting in its tail, and the eagle, a far-seeing predator soaring above petty problems into the spiritual sky. Scorpio's real involvement is not primarily based on love or even pleasure, but on the control and understanding of human emotions and the role they play in the mysterious processes of life and death. Though you may not spend your life pondering the mysteries of life and death, you are inquisitive and probing, fascinated with how things and people work. Your mental and physical powers of recuperation are remarkable — and truly evolved (eagle) Scorpios can learn to use their power to help and inspire others. The transformative energy of Pluto motivates you as you delve into the deepest mysteries of life. Whether you are trying to get to the bottom of a murder or some heinous crime, or whether you are saving a life through your surgical skills, or pursuing a meditative magical mystery tour, you characteristically seek to uncover the truth or to transform raw materials into things of great power and beauty. Relationships are not exempt from this probing, so anyone involved with you must prepare for profound changes in themselves, their mysterious partner and the relationship itself. Scorpio rules the reproductive organs and excretory system, so those with Scorpio active in their charts suffer headaches, infections and fevers, along with various illnesses to do with what used to be called the secret parts. You have, however, a strong constitution and can usually overcome your problems – many of which are of your own making, due to your clandestine activities. Scorpio colours are red, black, midnight blue, and emerald green. Scorpio rules metallic iron and your birthstone is the topaz. Topaz, one of the hardest minerals, cannot be cut with a knife. It is yet another representation of the impenetrable Scorpio nature. 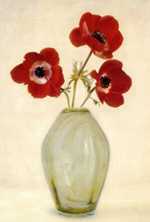 Scorpio flowers include the anemone, heather, and gardenia.